The workers and leaders from Lukrum Industries ruffle feathers in Olympus Town and could contaminate precious research locations. In the second episode of National Geographic's "Mars" Season 2, airing tonight (Nov. 19), the inhabitants of Olympus Town grapple with personal turmoil as well as the harsh realities of sharing Mars among scientists and a private, profit-driven enterprise. Once again, these hard truths on Mars, which could easily become reality once humans land on the planet, parallel what we experience here on Earth. In the first episode of this season, the docudrama showcased the realistic struggles that might arise when people dedicated to scientific exploration share the Red Planet with private corporations looking to turn a profit. In the wake of the events of "Mars'" tumultuous first season, tempers flared and relationships became strained. Unfortunately, things do not get easier for the residents of Olympus Town in the second episode of Season 2. In "Mars," it takes seven months for astronauts to travel from Earth to Mars and vice versa. If a disagreement were to arise that cannot be solved on the ground with the virtual help of those on Earth, concrete support cannot be sent from Earth in real-time. If a serious fight were to break out on Mars, for example, lives could be lost and research and so much more could be jeopardized before help ever arrived. Additionally, while the world of "Mars," like ours, has an Outer Space Treaty, humans have never before inhabited another planet, and so the legalities of life on Mars would likely be extremely complicated. This second episode once again uses oil drilling in the Arctic as an example of the drastically different opinions humans have about using a planet's resources. Just as there are those who drill in the Arctic with a mindset focused solely on profit (or, if they are the miners themselves, perhaps just keeping their jobs), there are activists who fight against it. The episode highlights the efforts of Greenpeace activists who work in the Arctic to draw attention to drilling efforts in an effort to stop such activities. The Outer Space Treaty was signed in the 1960s, before we knew just how possible it was to not only reach Mars but perhaps even mine its resources one day. The ethical and political issues that will undoubtedly arise as we progress toward Mars and establish a human presence there extend far beyond any political agreements currently in effect. Mars belongs to no one. But the same argument could be made for Earth, and the struggle between profiting from the planet's resources versus protecting the planet has raged on for countless years. This struggle will likely continue on Mars. Could Earthlings ever feel truly at home on Mars? Could humans survive on the planet without feeling the need to come home? Lukrum and Olympus Town didn't get off to the greatest start in Episode 1 of Season 2. But, after Comdr. Seung and Comdr. Kurt Hurrelle of Lukrum discuss the company's overuse of water, tensions began to build once again. Comdr. Hurrelle, who's following a corporate objective to use Martian resources, doesn't care that his actions might jeopardize the research done by scientists in Olympus Town. Currently, in the real world, researchers use rovers and remote instruments to search for signs of life or past life on the Red Planet. In the future, commercial operations could contaminate sites where scientists are searching for life. Sending scientists and their instruments to Mars in the future will certainly be an expensive undertaking. So, it makes sense to think that, if commercial exploits endanger that work, serious conflict will arise. In this episode, aside from the potential contamination of groundbreaking Martian research, the residents of Olympus Town also face grave realities. Life and death will play out in unexpected ways when humans inhabit Mars. This episode takes a stark look at what that might realistically feel and look like. Crewmembers grapple with the reality of living on Mars and struggle with the decision of whether or not to leave for their home on Earth. Will we, as Earthlings, be able to feel at home on an alien planet? Experts predict that future astronauts will contend with potentially severe psychological issues associated with the journey. Especially since, according to current predictions, astronauts leaving for the Red Planet would most likely never return. 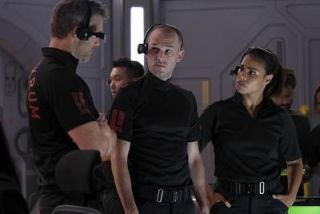 The episode also takes a candid view of leadership and the added difficulties women face in receiving equal respect from their male counterparts, even on Mars. Far from home, Cmdr. Hurrelle continues to disregard Comdr. Seung's rank and leadership. In this episode, Comdr. Seung handles this while dealing with personal grief and hardship.